In the past 36 hours or so I have not breastfed my son once. I am doing this on purpose, because I think it is time to completely wean him, but I feel really sad about letting go of this bonding time we’ve shared for the last 16 months. The past few nights I replaced our evening nursing with extended cuddle time in his rocker. I love this moment we have together, when he is calm, happy and just tired enough to rest his head on my chest and begin to close his eyes without quite falling asleep. He is growing into a really fun kid. I love playing with him and the little conversations we have. The back and forth we are able to share with his growing vocabulary has opened the door to this future where I will talk to my son about his day, life, anything. His development makes every day so fun for us. I am excited about the future. But I can’t help but feel a little sad about letting my baby go. 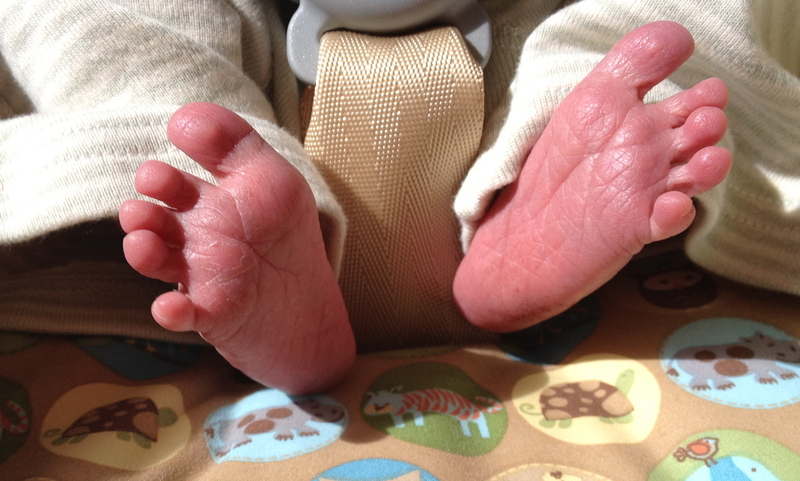 Sweet newborn feet. I miss them. When he was just a month old, my friend and I talked about this fleeting time. She has three kids, the oldest one already 10. She said seeing them grow up is better than the alternative. Tough words, but so true. My baby is growing up, and cradling him in my arms is already different than it was before, his long legs dangling down, his head trying to find a comfortable spot. I know that the baby stage is quickly coming to an end, and there is nothing I can do about it, but enjoy how fortunate I am to see him grow. I love watching him grow. So much.